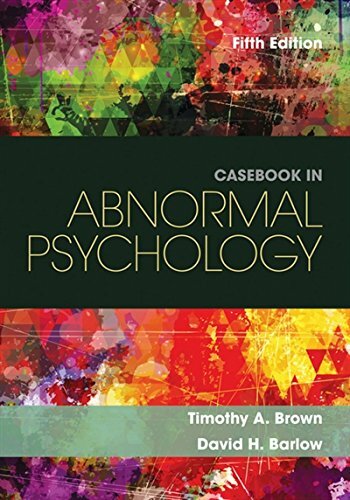 130597171X -Using cases from the authors’ files or from case files of other working clinicians, CASEBOOK IN ABNORMAL PSYCHOLOGY portrays the rich and arresting nature of disorders manifested in real people. Cases illustrate every major DSM-5 category, followed by a therapy outcome section that tells the “rest of the story” of what happened to these clients. Using an integrative approach, the authors emphasize the multiple causes of disorders and incorporate developmental and cultural issues in each case. Complex cases are presented without a diagnosis, so students can come up with a diagnosis on their own. This Fifth Edition has been fully updated to present the advances in scientific knowledge and revisions to the definitions of psychological disorders found in the latest edition of the Diagnostic and Statistical Manual of Mental Disorders (DSM-5).